Does the hoof of the horse require special nourishment? In a perfect world where the horse receives balanced nutrition from the moment of conception and throughout its whole life but especially from birth to maturity, the answer is no. Sadly that rarely happens. If it did, all horses would be able to grow hooves to the optimum of their genetic potential. Balanced nutrition means providing the essential nutrients needed by the horse for growth, maintenance and repair. It is not just about calories. Good hoof care is also vitally important. The subject of barefoot trimming versus conventional farriery is a subject which evinces emotional responses from both sides bordering on hysteria. The reality is that there are good and bad barefoot trimmers and farriers. The other reality is that some horses never need shoes and there are others that simply can’t go without them. My clients’ farriers are always telling them what brilliant hooves their horses have – and that is one of the big strengths of the VF natural diet. The philosophy of this diet is to provide a balanced diet with all the essential nutrients necessary for GROWTH, MAINTENANCE AND REPAIR while at the same time providing preventive nutrition which keeps the immune system in the best working order possible. 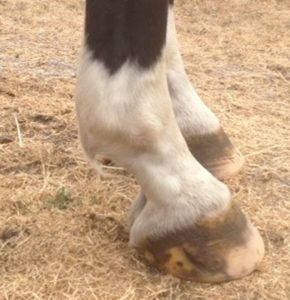 This results in horses with a very sound integumentary system (skin, hair, hooves) showing good rate and quality of hoof growth and a remarkable exterior glow indicating inner health. One of the most important herbal ingredients in the VF Natural Diet is Rosehips, which has extraordinary benefits for the hoof and the immune and respiratory systems. This is due to their amazing array of nutrients and medicinal properties. Rosehips contain the highest plant source of Vitamin C and numerous bioflavonoids (quercitin, rutin, hesperidin & others), mucilaginous compounds (pectin 14%), astringent compounds and aromatic compounds, sugars (fructose, sucrose, glucose) 15%, significant amounts of calcium, chromium, cobalt, magnesium, manganese, phosphorous, selenium, Vitamin A, niacin, riboflavin, thiamine and fibre. Vitamin C is an essential nutrient most famous for its ability to strengthen capillary fragility and connective tissue. The bioflavonoids provide antimicrobial and antispasmodic properties as well as strengthening the circulatory system in particular the capillaries. Bioflavonoids work synergistically with Vitamin C and most good sources of bioflavonoids are also good sources of Vitamin C, demonstrating the wisdom of nature. These nutritive and medicinal properties of Rosehips explain why they are so important for the health of the hoof, where the coronet band is filled with dense capillary beds. Also consider the lungs where capillaries abound. The lungs and the hoof are the areas continually under significant physical stress in horses, especially performance horses. 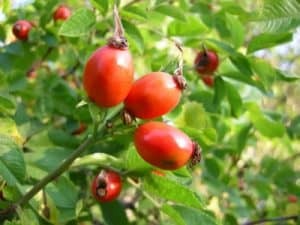 Detractors of the use of Rosehips in horses cite the presence of sugars in the herb, but it is impossible to isolate one compound as a reason not to use that herb. It is a reductionist viewpoint and all the constituents of a herb must be viewed as a whole, to understand the synergistic activity of that herb. This is the view of the classically trained herbalist such as myself. This is confirmed in practice. I have used and recommended Rosehips as an essential nutrient for pleasure, performance and breeding horses and as part of a therapeutic program for laminitic horses and ponies for 20 years with complete success. It is however important to understand that the other feed items and herbs are chosen to work in tandem with Rosehips. For the nourishment of the hoof Silica is an important mineral and this is provided with the use of Millet (french white variety) together with the correct balance of Omega 3 and 6 fatty acids, two more essential nutrients, provided by black sunflower seeds and cold pressed flaxseed oil. Hoof products abound in the market place – I have found that the use of herbal infused oils and oil blends with essential oils are very useful therapeutically and for encouraging hoof growth and healing quarter cracks, but best results are obtained when combined with the diet. My Terrain Every Day Hoof Oil is a mixture of Comfrey infused oil, Carrot Seed Infused oil and cold pressed flaxseed oil, It provides a barrier in both hot, dry and wet conditions. The Comfrey encourages hoof growth especially if the oil is applied well into the coronet band, the Linseed Oil helps to hydrate the hoof and the Carrot Seed Oil helps to repair cracks. My Confidence Specialty Hoof Oil also contains Comfrey but is mixed with Arnica Infused Oil and a small amount of Wintergreen Essential Oil. This oil is also used on the soles of the hooves so that the action of the Wintergreen penetrates into the bones of the hoof. 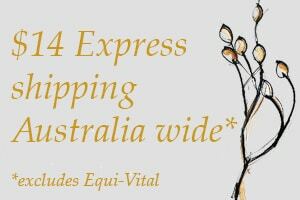 This oil is ideal for horses with laminitis, navicular syndrome, coffin joint problems. The Wintergreen Oil contains Salicylic Acid so could produce a positive swab, especially if the horse was also obtaining this from other sources such as Lucerne and Red Clover to name a couple of common feeds. It is also in the herbs Meadowsweet and White Willow. My Harry’s Lemon Grass Hoof Oil is specially designed to treat seedy toe. It is a blend of Carrot Seed Infused Oil with Lemon Grass Essential Oil. It is important to apply a few drops to the area on a daily basis regularly to get rid of this affliction, along with regular trimming of course.